Holy Cow! Have we got a warehouse full of incredible finds from all over Europe! 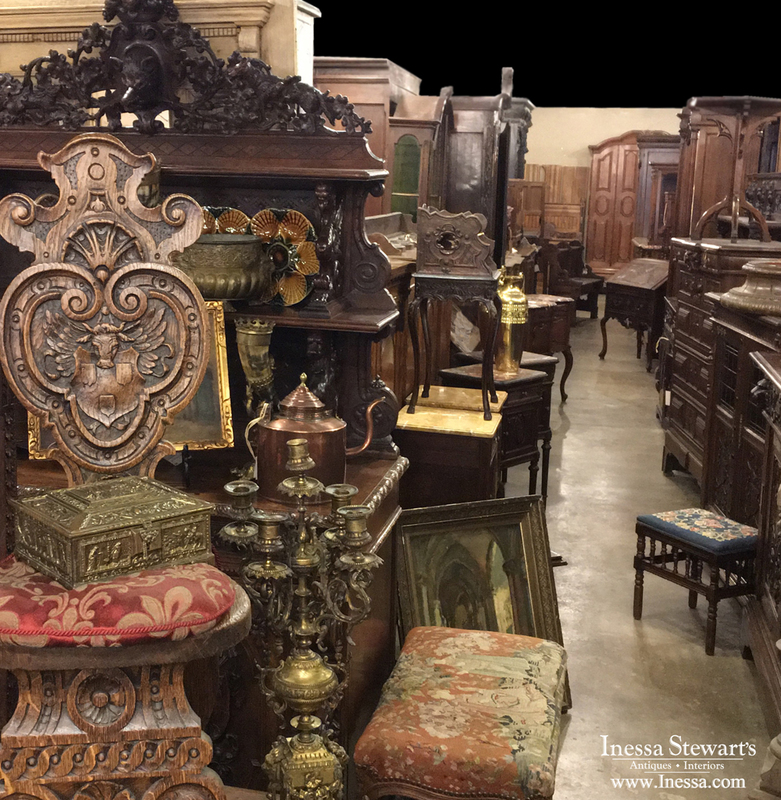 Both warehouses and showrooms are full to the brim with antique furniture, antique accessories, and exquisite antique paintings! With fifteen containers arriving in 2015 and even more on the way this year, we really need to make room every month. 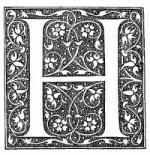 With this much going on we can’t mark everything down online, so you simply must visit our antique stores! If you can’t make it in, call us and we’ll be happy to tell you what’s new. 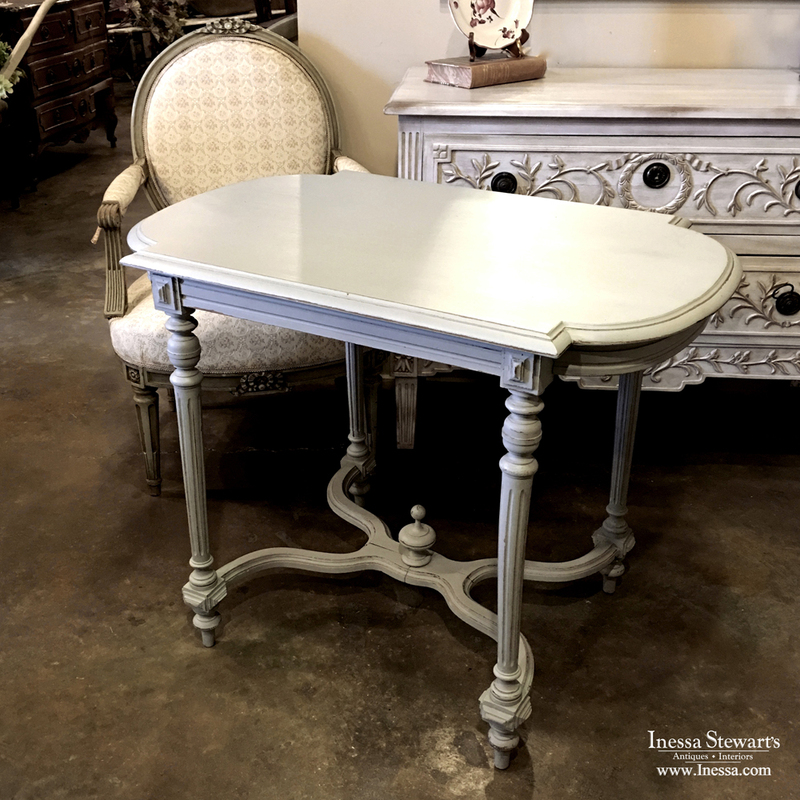 When you pop on in to Baton Rouge or Dallas antique store, you’ll be sure to find wonderful pops of color, elegant muted tones, and a dazzling array of natural wood finishes to compliment any home. 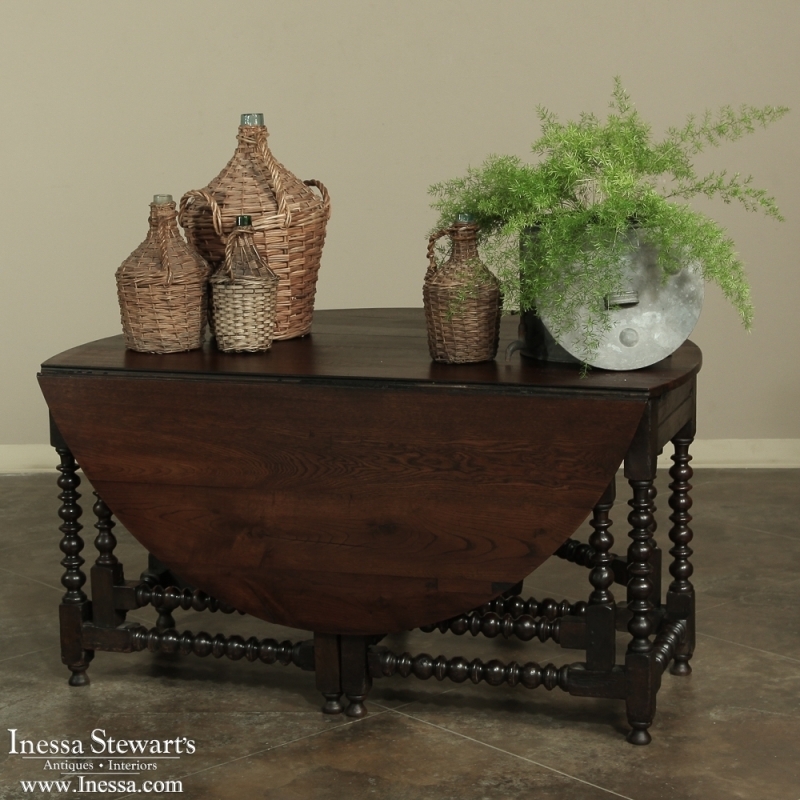 These are just some of the delightful things in store for you on your next visit to Inessa Stewart’s Antiques. La Crème de la Crème! We don’t just show leftovers for our Antique Warehouse Sales ~ we have all the best antique merchandise on sale! 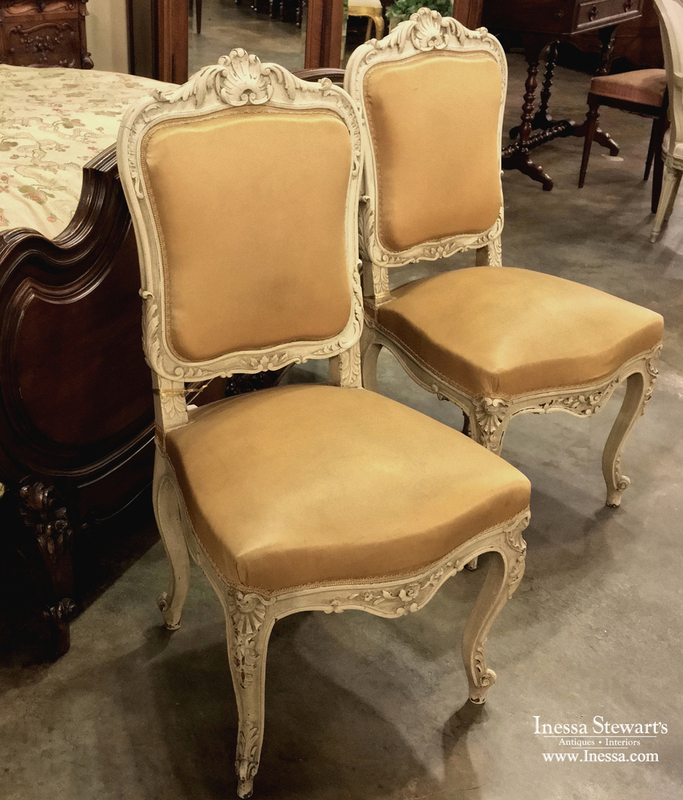 Like this amazing pair of antique hand-carved Regence chairs in their original cream colored patinaed painted finish. They’re the Cat’s Meow! There are Many Shades of Gray! You’ll never look at gray the same way again! Greige, the mix of beige and gray, is still the hottest neutral color, especially for antique furniture! It made its resurgence into our interiors during the past decade, and it’s here to stay! 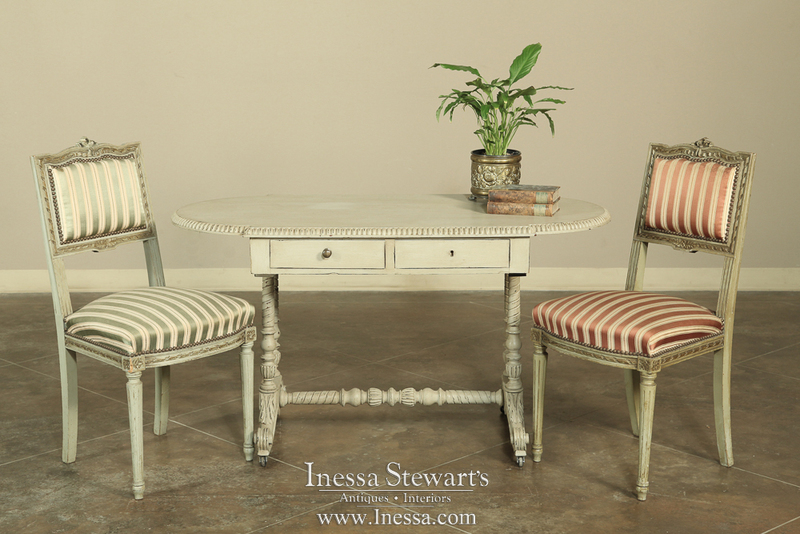 We have many shades of true antique gray antique painted furniture that can be layered for maximum impact. Pretty in Pink! Pantone’s color of the year, Rose Quartz, is a home decor must have. 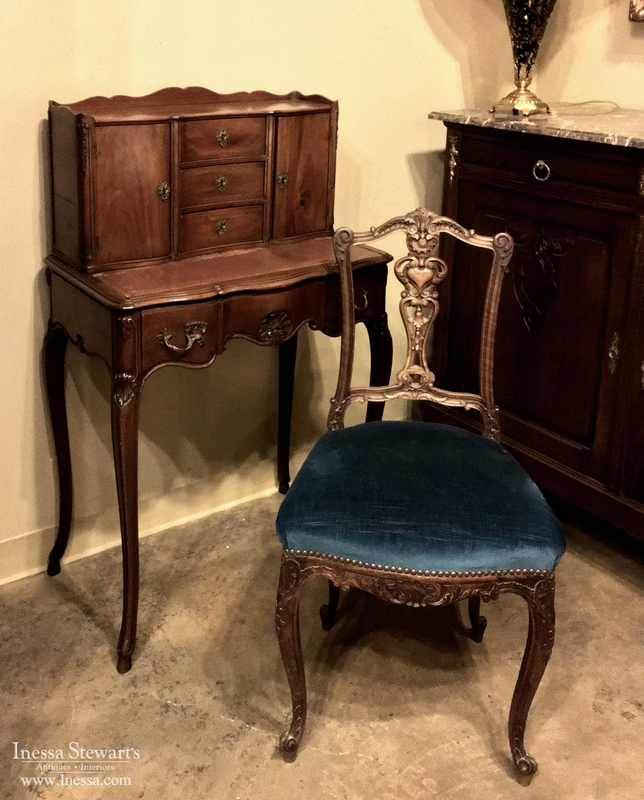 We have a great selection of pretty pink antique furniture and antique accessories that are totally on trend, and have been in style for over a hundred years! This remarkable petit point and needlepoint tapestry on the bergere and footstool with their original painted and gilded finish which has achieved a lovely patina over the past century, can be yours today, all part of our huge warehouse sale! Above are just examples of highlights of what we have in both huge showrooms ~ and we’re having a warehouse sale now, and will have one once a month, with new containers arriving continuously every month to make sure you always have new treasures to to discover! Autumn has arrived! And with it comes many wonderful opportunities to entertain with friends & family. 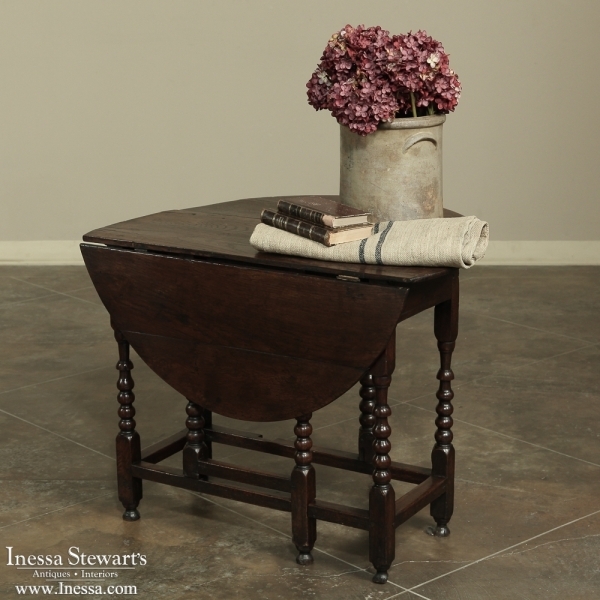 The antique gateleg table is a perfect versatile addition to any home this time of year. 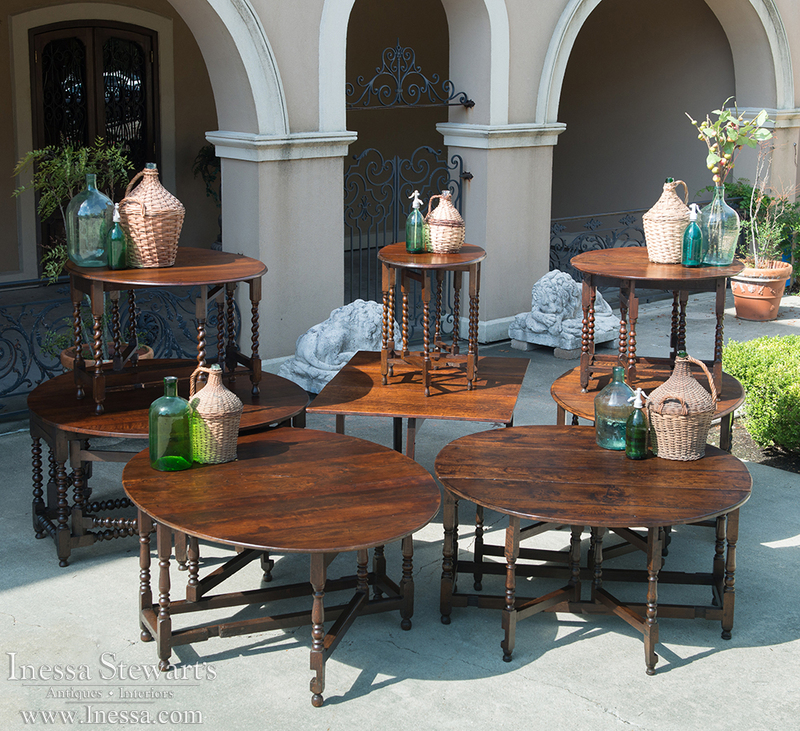 Use them in your kitchen, living room, or just about anywhere as extra serving space and as dining tables for authentic European country style. 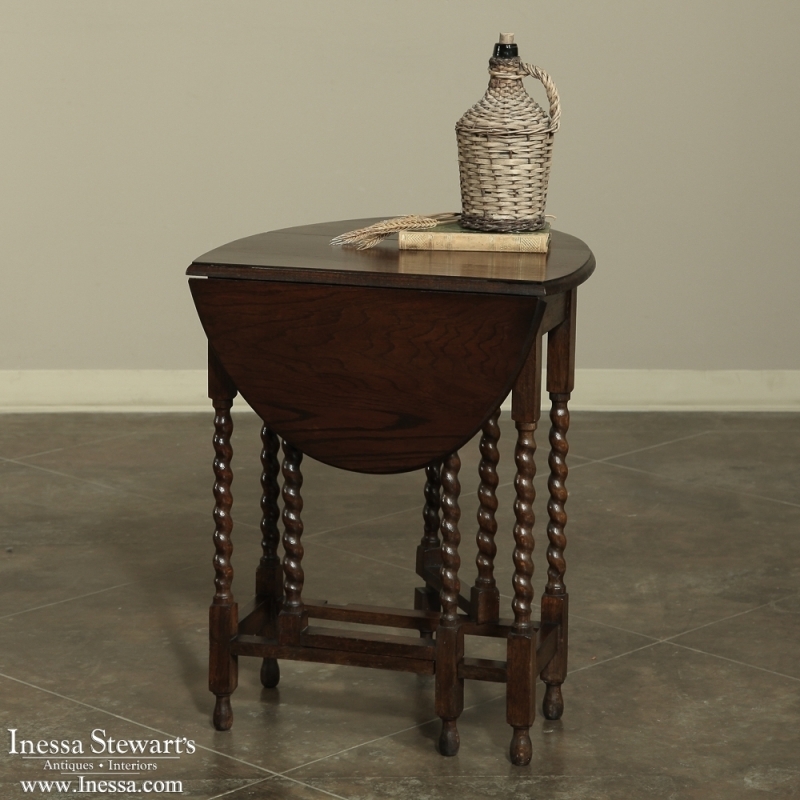 Smaller gateleg tables make perfect side tables for lamps to cozy up with a good book or for kids tables around the holidays. Keep one folded behind your sofa for a unique sofa table that is easy to convert into a serving piece for appetizers. 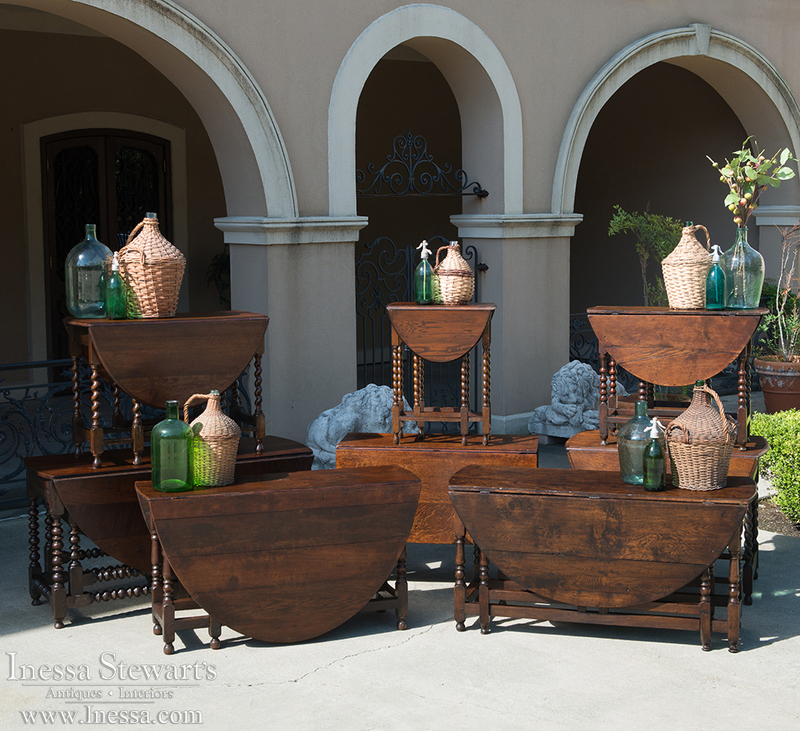 They even serve as charming, rustic entry way consoles in between entertaining! 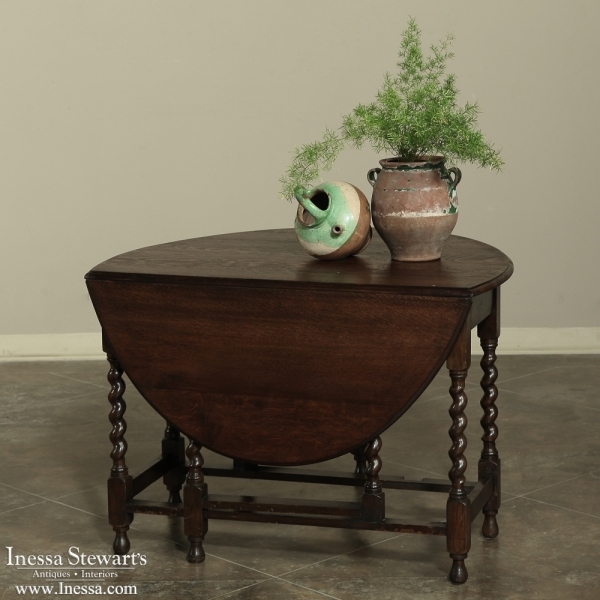 We are fortunate enough to have a wide selection of 18th & 19th century European antique gateleg tables available right now. From petite side tables to full dining tables, these versatile pieces can be used in every room in the house! Wishing you all a lovely fall season! The antique writing desk for most of its time was a place of reflection, a space where one could pen long, heartfelt letters to a dear friend. 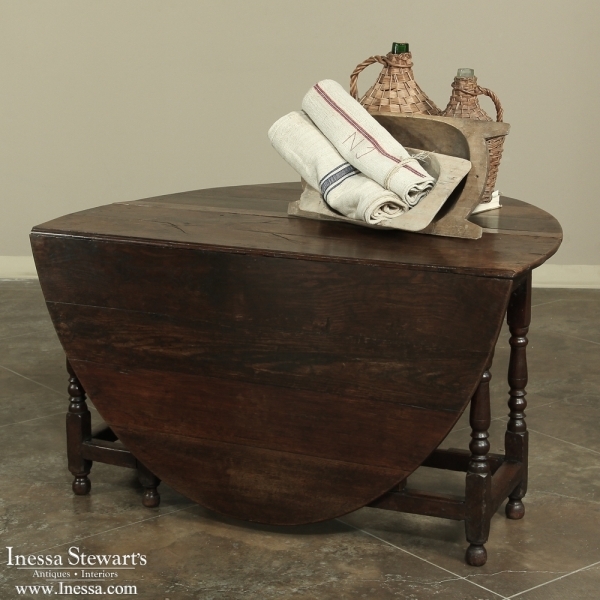 Today we mostly use this type of antique furniture for laptops, quick meals, and as side tables. 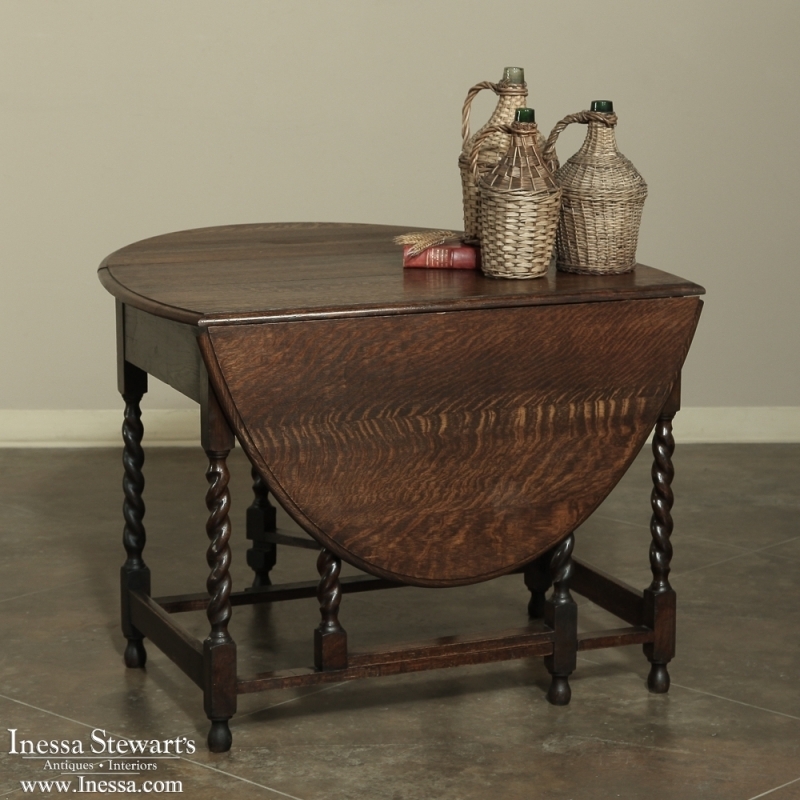 In the case of this antique hand-carved desk, you can do all those things while sitting at a beautifully painted patina finish top, enjoying the history of the past and versatility of the present. 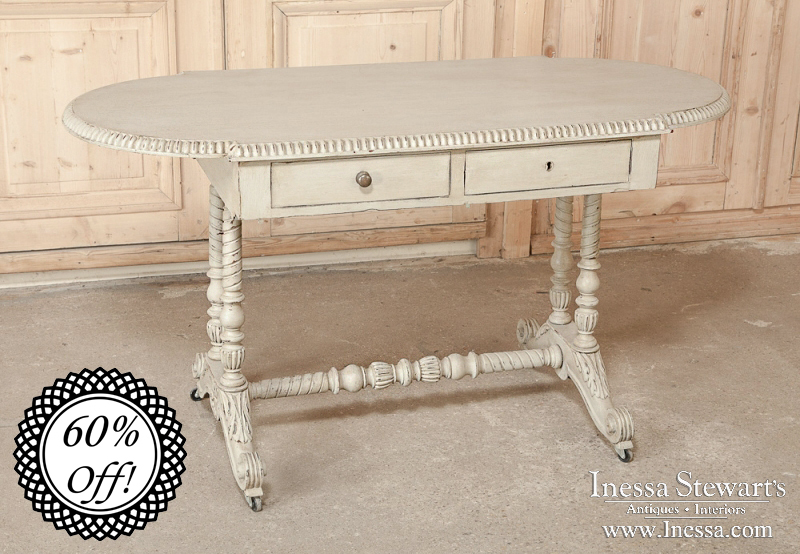 What makes this lovely desk even sweeter is its Bargain Brocante price! Just click the photo to go to our website and see this lovely item and many others, including the two cute chairs in this photos. They are are also an amazing deal, directly from France at wholesale prices. 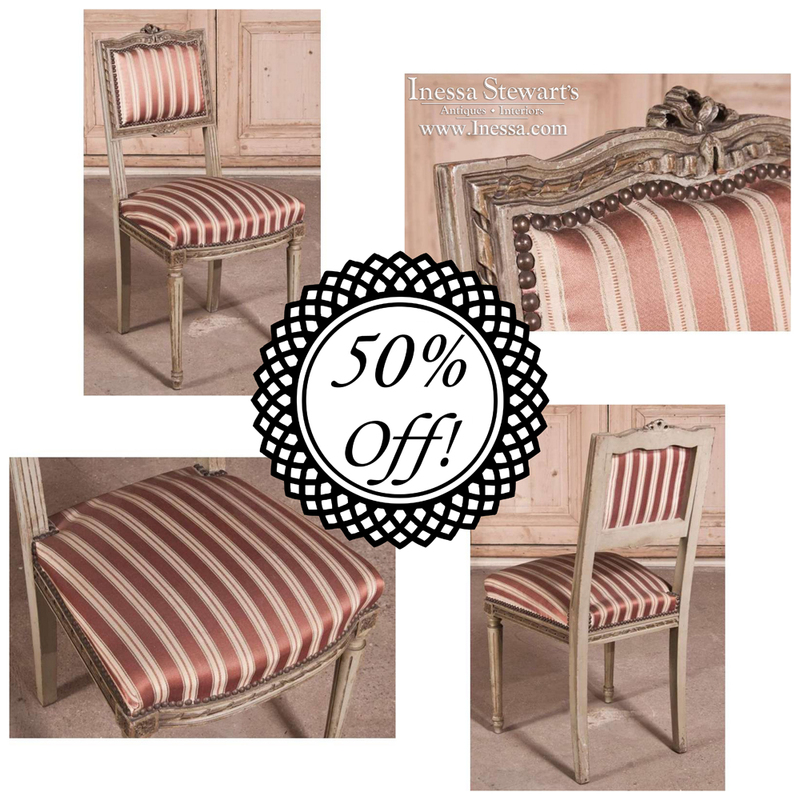 These 19th Century French Neoclassical Painted Chairs makes a great choice for a more elegant room, or perhaps a desk chair or just a convenient, attractive occasional chair for any room! 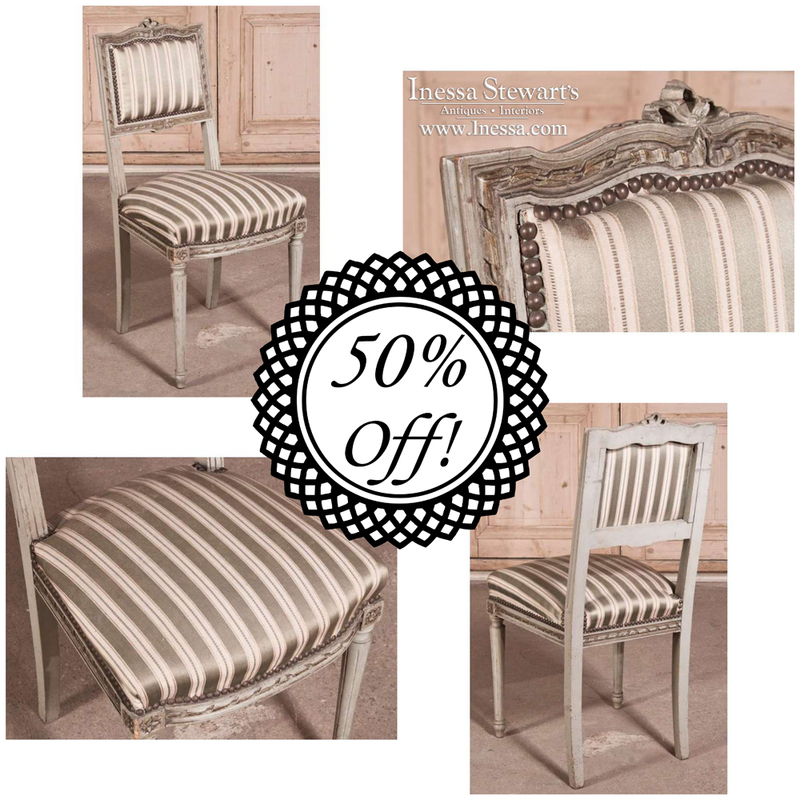 Neoclassic styling includes arbalette seatback crown, with subtle spiral ribbon and acanthus rosette accents. Painted finish has achieved a lovely patina over the past century.